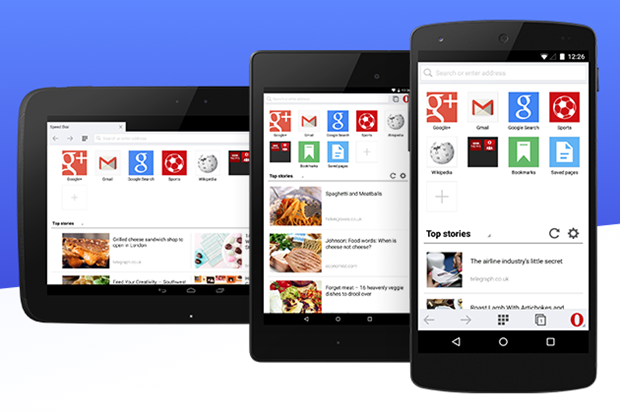 Opera Mini 8 for Android users has been launched. It gives a smoother interface and lightning speed browsing. With options like private browsing, compressing the web pages for saving data, speed dial and many more make it a perfect one to pick for your android devices. As the web pages are compressed by 10%, the users will now able to load the contents faster. The revamped design and the user-friendly interface give it a much better look than the previous versions of Opera Mini browser. It will display the data saving in percentage so that you can easily calculate the amount of data saved. Most interesting feature about the Opera Mini 8 is that, it now supports swipe gestures, which will help you to delete the bookmarks or close the tabs just by swiping. The discover news feed will get you all the latest news at your fingertips. You need not search or browse any specific website to stay updated with the happenings all around the world. Looking at the people who use Android smartphones in the present market are 81%, according to the report of IDC, we can except that the goal of the CEO will soon be achieved. So, with this Opera Mini update for Android, the firm intentions are quite clear – to increase the number of users for the mobile browser. How many of you have updated your Opera Mini browser? Did you find any new feature apart from the ones mentioned here? If yes, then let us know via comment section. Don’t forget to share and let your friends know about the update!